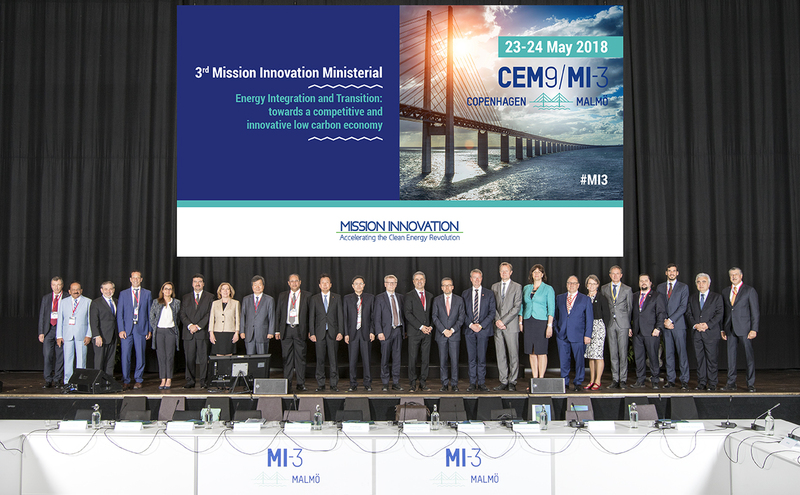 Malmö, Sweden, May 23, 2018 – At the Third Mission Innovation (MI-3) Ministerial, the international community discussed bold steps to enhance public and private investment and collaboration on clean energy research and innovation. The Ministerial was co-hosted by the European Commission, together with Denmark, Finland, Norway, Sweden and the Nordic Council of Ministers. Mission Innovation Ministers demonstrated significant progress by members halfway through the initial five-year commitment to Mission Innovation (MI) and launched activities to deliver on MI’s goals with the public and private sectors over the next two years. An additional $4 billion of public sector funding in clean energy innovation has been invested since 2015; nearly forty new international research and innovation partnerships initiated; and the MI Champions programme was launched to recognise change-making innovators. Ministers gathered in Malmö with key thought-leaders, Mayors and CEOs from global companies including ABB, ENGIE, Tata and Northvolt. Concrete results emerged from the discussions on public-private cooperation in key technology areas. On batteries, a declaration on the role of innovation to develop sustainable battery value chains was endorsed, and Ministers and CEOs agreed to work on sharing the performance of building’s data to reduce the enormous amount of energy lost by poorly performing heating and cooling systems. In addition, national governments will test new public-private innovation mechanisms. For example, India launched an international incubator for clean energy innovators to test technologies in local markets, and Sweden announced a competition open to all MI members to promote disruptive innovations through public-private procurement partnerships. “Public-private co-investment vehicles are needed to support and finance deep-tech energy innovations, reduce risks and improve the effectiveness of available public and private funding. The EU is developing new instruments, including the European Innovation Council, and we are looking forward to cooperating with international partners to consolidate this experience in the field of clean energy.” said Carlos Moedas, European Commissioner for Research, Science and Innovation, European Commission. Around forty new programmes were announced, ranging from international partnerships to initiatives at the country level aligned with the MI Innovation Challenges. These included an £11 million ($20 million CAD) UK-Canada collaboration on smart grid and energy storage innovation and an annual $1 million programme to support international collaborations around Innovation Challenges from the Republic of Korea. In addition, a new Hydrogen Innovation Challenge was announced to accelerate the development of technologies needed for a global hydrogen market. “Private engagement in clean energy innovation is a key focus of this year’s Ministerial meeting. I am pleased to see that the cooperation with the World Economic Forum and Mission Innovation members is already bearing fruit. I believe public-private partnerships, together with the engagement of cities, are vital to achieving our Paris climate objectives” stated Maroš Šefčovič, Vice-President of the European Commission for the Energy Union. Innovative breakthroughs and individuals were celebrated throughout the Ministerial. At the Solutions Summit, the MI 2020 Solutions booklet was launched, showcasing over fifty cutting-edge breakthroughs emerging from MI members investments ranging from blockchain technologies to the world’s first commercial passenger electric boat. Additionally, MI launched the Champions program, which will recognize exceptional researchers and innovators who are developing novel ways of making energy cleaner, cheaper, and more reliable by using it more efficiently. The CleanTech Capital Day, an annual innovator and investors event, announced the ten most promising Nordic clean tech companies. MI members were also pleased to welcome Austria as the 24th member of MI and to announce enhanced cooperation with both the International Energy Agency (IEA) and the International Renewable Energy Agency (IRENA) to improve the tracking of clean energy innovation progress. The Ministerial closed with MI Ministers endorsing next steps over for the next few years and urged continued progress and ambition to remain on track to meet MI’s goal of accelerating clean energy innovation. Ministers were invited to the next MI Ministerial to be hosted by Canada, Vancouver in May 2019. Mission Innovation (MI) is a global initiative of 22 countries and the European Commission (on behalf of the EU) partnering to reinvigorate and accelerate clean energy innovation with the objective of making clean energy more widely affordable. It recognises that accelerating widespread clean energy innovation is an indispensable part of an effective, long-term global response to the climate challenge, necessary to provide affordable and reliable energy for everyone and to promote economic growth, and critical for energy security. Member countries represent 58% of the world’s population and over 80% of public sector clean energy research budget. Mission Innovation members share a common goal to develop and scale breakthrough technologies and substantial cost reductions. MI members aim to seek to double public clean energy research and development investment over five years (to 2020/21). They are also encouraging greater levels of private sector investment and partnership in transformative clean energy technologies.